Honey Bootique: Gorjuss art journal page- Have You Seen My Heart? Gorjuss art journal page- Have You Seen My Heart? I stamped out the Gorjuss image and coloured with copics and fussy cut (leaving no white space). I paper pieced her dress and stamped her head a second time so I could have a layer of her hair over the dress. I added some copic shading to her dress and some copic clear spica pen for her crown. For the page I used my vintage book again. I stuck down some book pages, vintage music sheets and tissue paper and added some masking tape for texture. I then covered the page in gesso. I then sprayed Crafty Notions Gold, Lindy's Sandra Dee Sepia and Rizzo Randy Red sprays and let dry. I also used some spritzed Iced Currant Gelato. I then stamped Stamping Bella's Multi Media Mini Checker Background stamp and finally splashed some Distress Ink Picket Fence and Lindy's Blazing Black across the whole page. 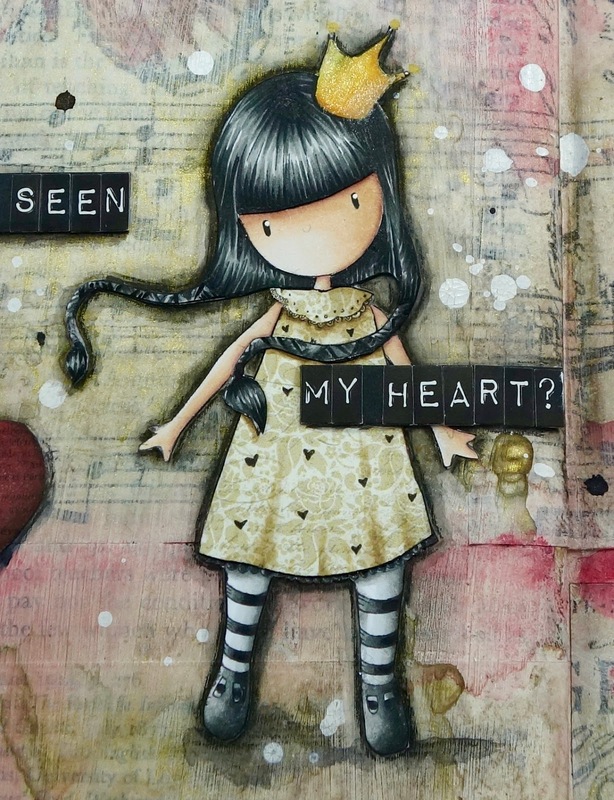 I then cut out some hearts from the MME paper pad I used for her dress and coloured/smudged using Iced Currant and Black Liquorice gelatos and adhered across the page. I also added a piece of matching striped paper. 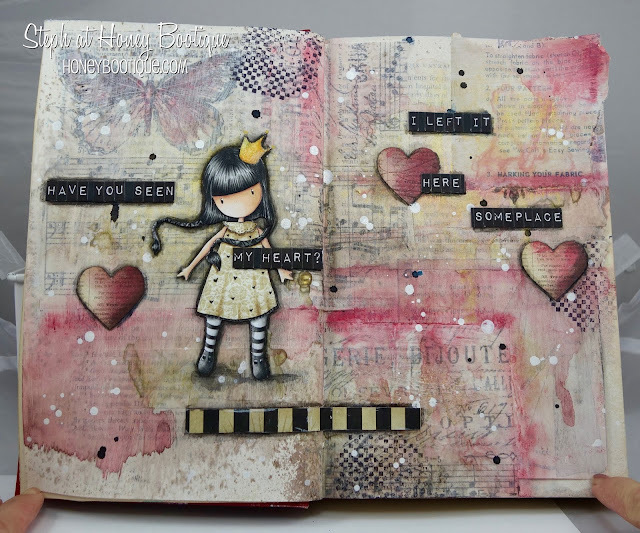 Finally I added the Gorjuss image and then added my title using Tim Holtz alphabet stickers. I outlined everything using a pencil and Black Soot Distress Marker softened with water. Here's your close up! Can you see the sparkle on her crown? I decided to enter this into Simon Says Stamp's Monday challenge which is "a trio of something"- mine is the 3 hearts.